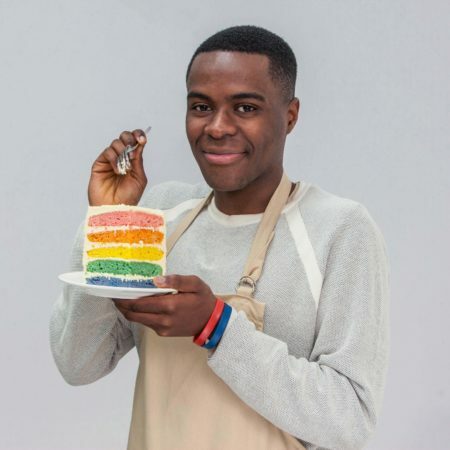 Student Liam was born in Hackney, North London, and is fondly known as the ‘Cake Boy’ amongst his university friends. Having only baked for 4 years, Liam already has a vast baking repertoire under his belt. Liam strongly believes that baking is a universal language that can bring people together from all walks of life. One of Liam’s main ambitions is to make baking acceptable amongst his peers and the younger generation. This ambition begins at home where Liam regularly bakes with his young nephews to install that positive attitude in them. Punchy flavours really are Liam’s ‘thing’, and his Caramel Week Signature bake – Salted Peanut Millionaire Shortbread – shows off his skills to a T.
We cannoli say good things about Liam’s Italian Week Signature recipe – a nutty treat if ever there was one. Liam’s got his nan, Cynthia, to thank for this knockout hand-raised pie recipe. A Sunday lunch Showstopper if ever there was one.